Have you ever discovered a restaurant so good you didn’t want to tell anyone about it for fear it would be overrun? That’s exactly the way Patrick felt about a certain trattoria in Rome when he was filming there. They have a house speciality called Tonnarelli alla Ciociara which, in his words, “would make a grown man weep with pleasure”. This recreation did get our stomachs rumbling, and the name of the restaurant? You’ll have to twist his arm to find out! Put a large pot of water on to boil with ¼ tsp of salt ready for the pasta. 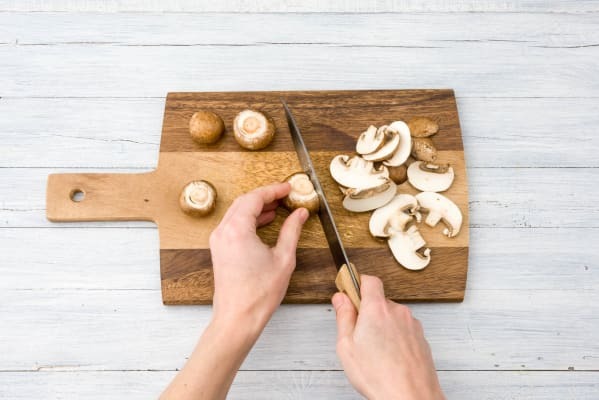 Roughly slice the mushrooms. Peel and finely chop the garlic. Pull your thyme leaves off their stalks. Cook the pasta in the boiling water for 8 mins or until ‘al dente’. Towards the end you’ll add in the peas but we’ll remind you later. Tip: ‘Al dente’ simply means that the pasta is cooked through but has a slight bit of firmness left in the middle. 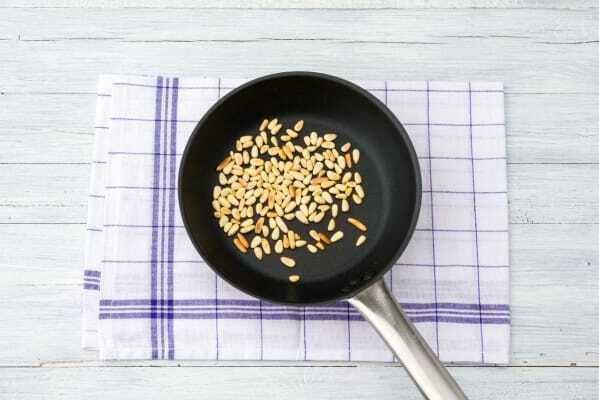 Toast the pine nuts in a dry frying pan over a medium heat until they turn golden, then remove and keep to the side. Watch your nuts like an insomniac counting sheep - the moment your head is turned they’ll burn! Heat 1½ tbsp of olive oil in the frying pan until hot. 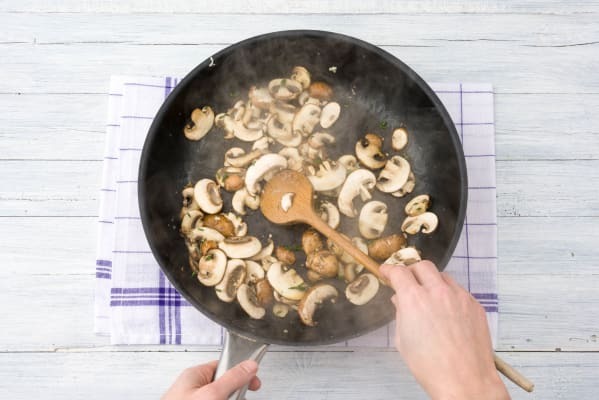 Add the mushrooms, garlic, thyme and fry for 3-4 mins over a medium-high heat. Remove half a cup of the pasta water from the pot and keep to the side. Add the peas to the pasta for the last 3 mins of cooking, then drain. 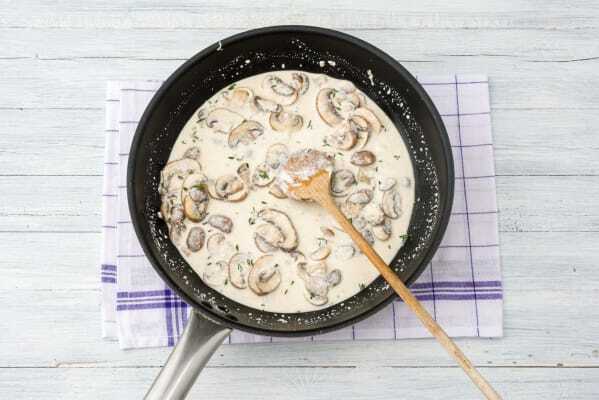 Add ¼ tsp of salt to the mushrooms followed by your ricotta. Add a few tbsp of pasta water until you have a nice double cream consistency. 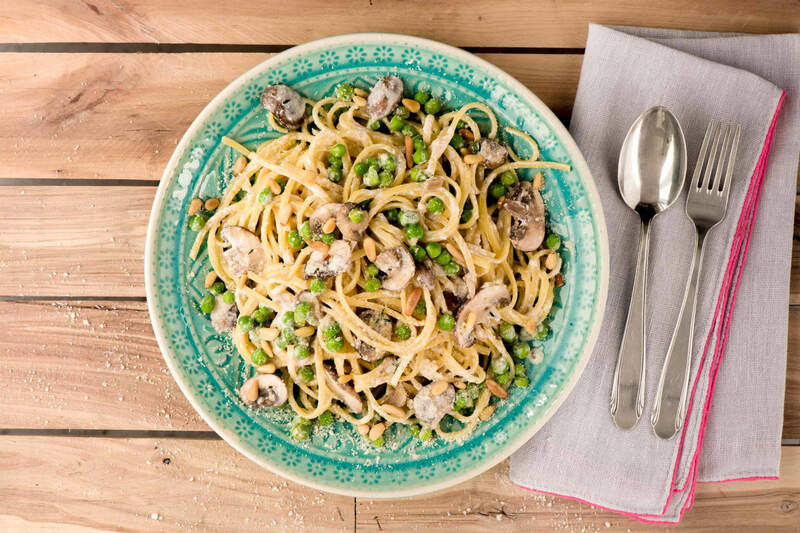 Add a few grates of lemon zest, 1 tsp of lemon juice and toss in the pasta and peas. Add half the grated Italian cheese and toss everything together. Serve with a scattering of the remaining cheese, the pine nuts, a few grinds of pepper and a drizzle of olive oil.